I want to get excited about Half-Earth: Our Planet’s Fight for Life, both the book that came out this month and the idea behind it. Prominent conservation biologist E.O. Wilson has argued for over a decade that the surest way to halt the mass extinction currently underway is to concentrate human activity in only 50 percent of the Earth’s surface area, and leave the rest predominantly for nonhuman “wilderness.” The plan emanates from a simple ecological rule—reducing the area of a habitat reduces the number of species it can support—but there are also political, economic, ethical, legal and pragmatic components. I was eager to see these complex ideas developed and explored at length—and I was not alone. 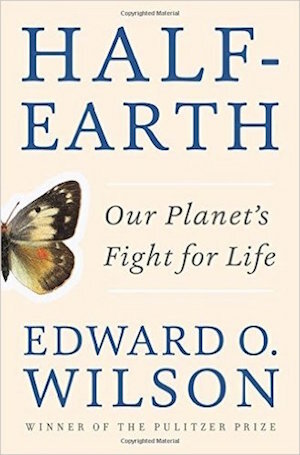 Wilson’s idea started getting coverage long before the book came out: Since November 2014 the “Half-Earth” idea has been explored sympathetically in the New York Times, io9, National Geographic and other publications. The concept got a feature-length treatment in Smithsonian, where writer Tony Hiss explored how ecological restoration is playing out—and might expand—throughout the United States, including in the rural South, New England and the Greater Yellowstone Ecosystem. I had hoped that Wilson’s new book would build on this conversation, tighten the arguments for the plan and lay out a science-based political pathway. Unfortunately, it does not. Instead, Wilson saves any mention of his plan (outside of the preface) for the last quarter or so of a slim 200-page volume, and even then paints a less detailed picture than Hiss’s Smithsonian article. The majority of the book sits as a fairly unremarkable entry into a well-worn genre: a glimpse at Earth’s biodiversity and an explication of the current mass extinction. I understand the relevance of this content—if we’re discussing a plan to save Earth’s biodiversity, it’s helpful to understand what that biodiversity looks like and what threats it’s facing. But by spending the majority of the book on this exposition, Wilson misses a chance to expand upon the proposal that makes his book new and exciting. Others have written similar tracts—including Wilson himself—with more panache, not to mention more substantive scientific content. These sections of the book are not without redeeming qualities: most notably, and I mean this with utmost sincerity, Wilson—an entomologist by specialty—writes exceptionally compelling prose about ants. But the book is ultimately rather rambling, and feels haphazardly spliced together. Where Wilson might have convinced us the living world deserves to be saved, he instead spends a strange amount of time on the virtues and delights of being a biologist, specifically the type that gets to discover new species. His most clearly stated moral position is that extinctions are bad because they deprive scientists of further objects of study. This is a valid point—a full taxonomy and natural history of all of Earth’s species could be indescribably valuable for both intellectual and economic reasons—but I am not sure it will resonate with the wide range of people the conservation movement needs to engage to cede half the planet to wilderness. And therein lies the largest problem: one gets the sense that Wilson has little interest in movement building. He seems more concerned with the funding of conservation NGOs than popular support for their mission. This is reflected in the two examples he holds up of ecological restoration: a push to revive forests in the southeastern United States and work being done in Mozambique’s Gorongosa National Park. These efforts are environmentally promising, but they don’t offer much guidance for how to enact social change. Both projects are financed by American multimillionaires: former gambler and businessman M.C. Davis in the Southeast, and tech entrepreneur-turned-philanthropist Greg Carr in Mozambique. This isn’t to critique these two ventures, which appear to be admirable. Their projects may offer insight into what sorts of things successful conservation campaigns might do, but they are not particularly helpful in suggesting how they will be organized and run. I’d prefer the fate of the biosphere to depend on something less fickle than the benevolence of millionaires. For this reason, the book is less a call to action than a benign assurance. He alludes to big issues like a moral reconceptualization of how we interact with our planet, but his solutions to material realities like overconsumption in industrialized nations are far less grandiose: He has faith that the free market and scientific innovation are already fixing this. The book does at least try to challenge the way we think but leaves little for us to actually do: the capitalists and the technocrats have it under control. In two prior books—2002’s The Future of Life and 2014’s A Window on Eternity—Wilson had also suggested conserving 50 percent of Earth’s habitat. These provide helpful insight into his philosophy while highlighting some of his more contradictory beliefs. Most alarmingly, in A Window On Eternity we learn his faith in capitalism is slightly more cynical than he makes it out to be in Half-Earth. In his earlier book, he essentially writes off the 50 percent of the Earth where most human activity is meant to take place. It’s taken as a given that humans will run roughshod over wherever they live, which is why so much land has to be off limits. If we look further in his past, to The Future of Life, we can find hints of a more political Wilson. He points at the importance of addressing global inequality, the critical role of protesters (at least until they get too rowdy), and the need to respect indigenous peoples’ rights to their land. Variations on these themes continue to crop up in interviews today, though they have become less prominent in his writing. But he also, in The Future of Life, shows an instinctive distaste for any divisiveness, chastising both environmentalists and their “people-first critics” for stereotyping each other. He confidently asserts that most people ultimately want the same things—“a highly productive economy,” “lots of well-paying jobs,” “a clean environment,” and “private property” as “a sacred right”—and glosses over any real ideological differences. In Half-Earth, Wilson goes so far as to say most of Earth should be barred even from temporary human visitation, except from professional biologists like himself. Even if one shares Wilson’s rosy outlook on technology and the free market, his worldview is garbled: humanity must realize it is but one of many species within Earth’s biosphere and then immediately minimize its interaction with true wilderness (barring the scientists who get to study it); the human enterprise (broadly construed) is ecologically destructive but innovators and entrepreneurs can be relied upon to fix it. We are doomed by our own nature, except those of us who aren’t, and the only solution is to separate ourselves entirely from nature. What’s so frustrating is that behind Half-Earth is a provocative idea, and Wilson has the brains and stature to make the case seriously. It is a pity he leaves so much unanswered, but I hope he has at least opened arenas for others to explore. He estimates our current wilderness area at around 15 percent of Earth’s surface, so if half-Earth is to be accomplished, a lot of work needs to be done. In The Future of Life, he declares environmentalism “a contest that will not be settled by partisan victory.” But wilding 50 percent of the planet would require a political movement both to shift people’s perspectives towards the environment and to confront—and dispossess—those who profit from destruction. Such a movement must join the rich tradition of democratic struggle for social change, not stand apart from it. Wilson describes his ideal of wilderness as “self-willed,” not managed top-down by the powerful. He should want the same for humans.